Inbox Pause: The new amazing new Gmail feature you'll want to activate. For ages now I’ve touted the wonderful benefits of Boomerang for Gmail to help me better manage my incoming and outgoing email, and it seems the folks at Google like the feature themselves. Because now Gmail has actually incorporated Boomerang’s technology into a brand new feature called Inbox Pause. And it is awesome. Especially if you struggle with work-life balance. Or email-life balance, as it were. 1. Stopping email during certain times that you specify. This is fantastic for cutting off email during mealtimes, non-work hours, or just times you need to force yourself to totally focus on something. Something that is not email, that is. 2. Turning on an auto-responder. 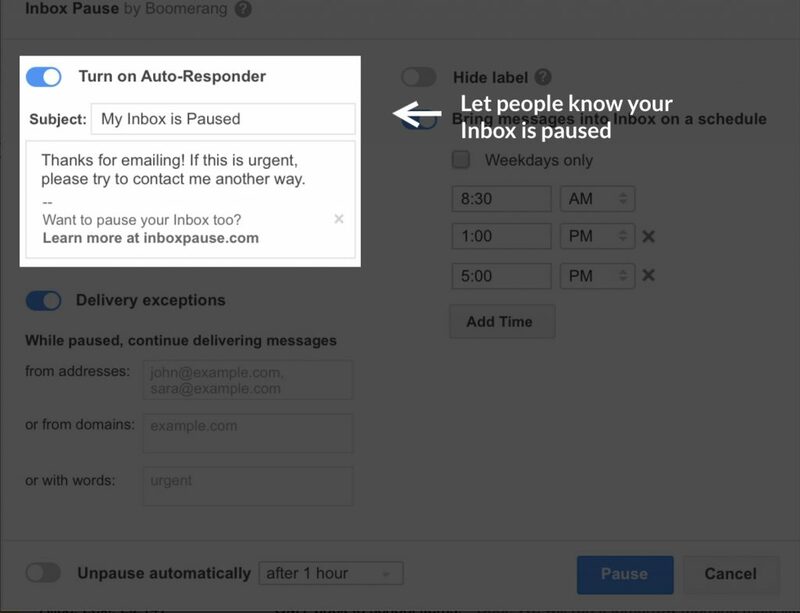 This lets people know your inbox is paused and that they can contact you another way if it’s urgent. Though presumably your closest friends and coworkers will know that already. 3. Unpausing automatically after a set amount of time. That’s pretty self-explanatory. 4. Creating delivery exceptions. Say you only want to get emails from your boss, your kids, or anyone with a youwonthelottery.com domain. You can do that with Inbox Pause — though you will have to upgrade to a pro or premium account for this. You can also let certain keywords come through if you’re expecting something important and know words that the subject line will include. In order to get all this wonderfulness, you just need to authorize it, since Inbox Pause is coming from third-party company. Boomerang is formerly Baydin by the way, which is why you’ll get a Google pop-up telling you to “authorize baydin.com.” From there, you have to agree to let them read, send, delete and manage your email, which is basic stuff that looks kind of awful on first glance. It’s no different than most third-party services that you might authorize for Facebook or Twitter. And really, it’s like Gmail itself “reading” your email. How do you think that they manage to serve you ads that relate to your content? You can read more about apps connected to your Google account here. 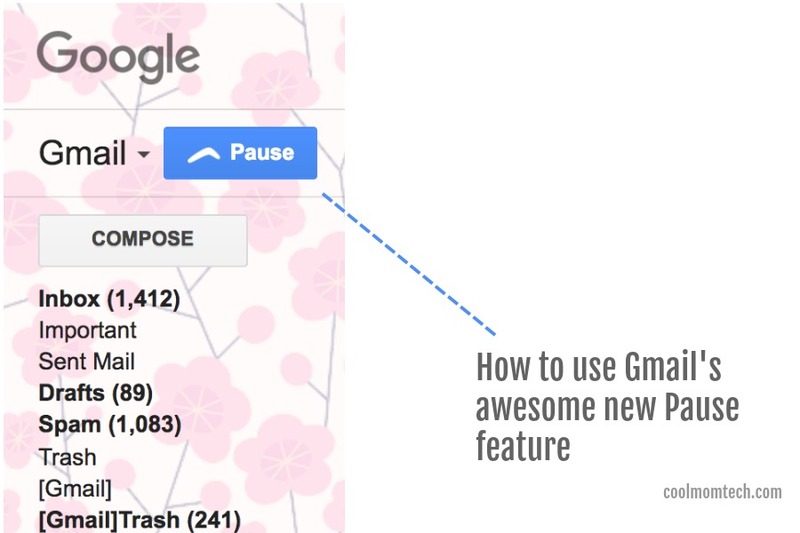 If that freaks you out, forget Inbox Pause — you probably shouldn’t use Gmail at all! Privacy is what it is these days. You have to decide what your own boundaries are. As for the pricing, that’s up to you too. I’m happy with the Personal Plan on Boomerang for $4.99/month, which is totally worth it for the amount of daily use I get out of it. But even if you just stick with the basic free version of Inbox Pause and get a little life back in your life by slowing down your email flow here and there? Well hey, free is always worth it to me.